I last wrote on the final day of our strike action to save our pensions. Since then, I have been on ‘action short of a strike’. What that means is open to debate, but I have simply decided to work 35 hours per week, as per my contract. I have also decided that weekends are weekends and vacations are vacations. This sounds absurd doesn’t it? Being on action short of a strike means that I’m working the way I’m supposed to be working. But such is the culture of overwork in academia that even this takes effort and commitment. It is, however, liberating. I feel I may continue working like this beyond the period of industrial action. A copy of the Farnese Hercules at Chirk Castle, North Wales. 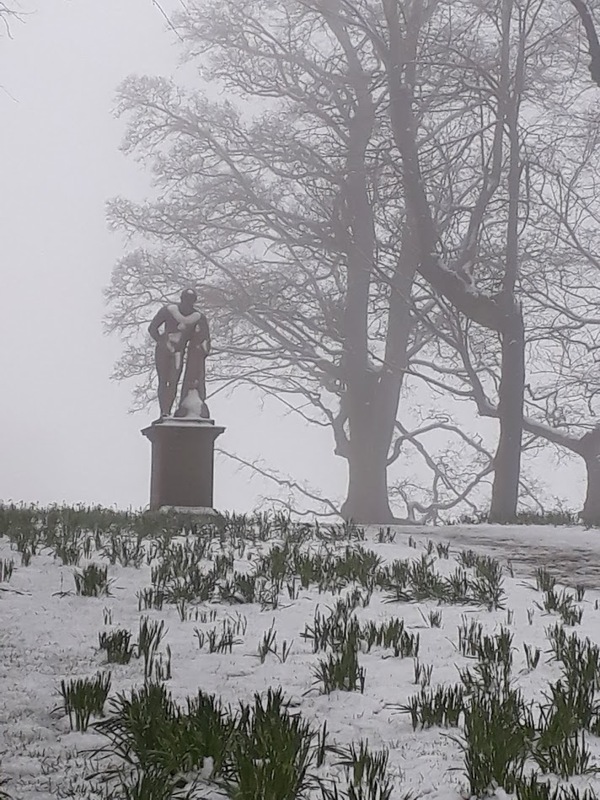 Photo taken this Monday – yes it was snowing. Much has happened in our industrial dispute over the last three weeks. Two weeks ago, late on a Friday afternoon, we were informed that our employers (UUK, Universities UK) had made an offer. That offer consisted mainly in promising the constitution of a joint panel of experts who would work on future plans for our pensions. In the opinion of many (me included), that offer was extremely vague but somewhat promising. 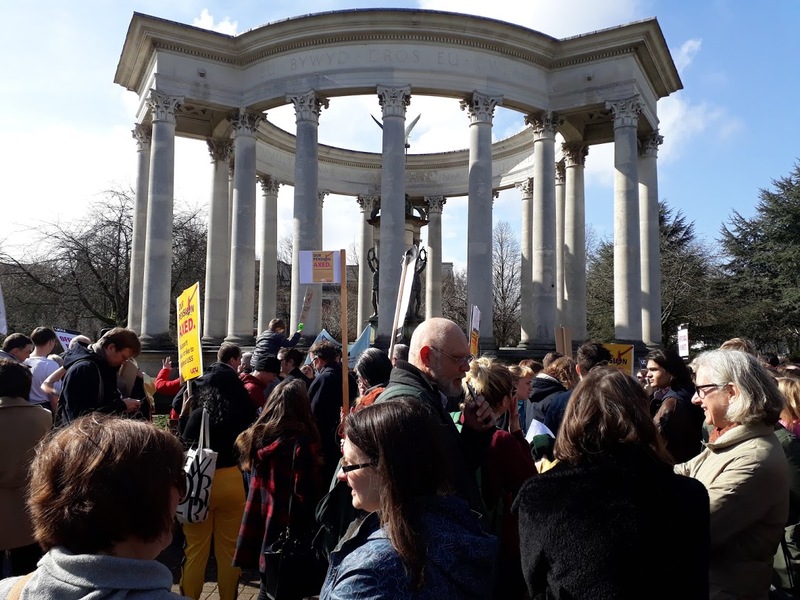 Our Cardiff union branch, like many others, passed a motion to ask the employers to ‘revise and resubmit’ (to use a phrase that is familiar to anyone who has published in an academic journal) their offer. Unfortunately, and for reasons that remain unclear, these motions were ignored by the union leadership, and we are now faced with a vote on whether we want to accept the UUK proposal or not. I have voted ‘no’. The issue is that, whatever the result of the vote, we don’t know what comes next. This is very unnerving. What is clear, on the other hand, is that our fight is not solely against our employers; it is also against a legal system that seems entirely in favour of ‘de-risking’ pensions, that is, moving risk away from employers and onto individual employees. I use quotation marks for ‘de-risking’ because to me this seems a most risky strategy: some employees will make ‘good’ investment choices (and note the quotation marks here too because a profitable investment is not necessarily an ethical one); others will not. 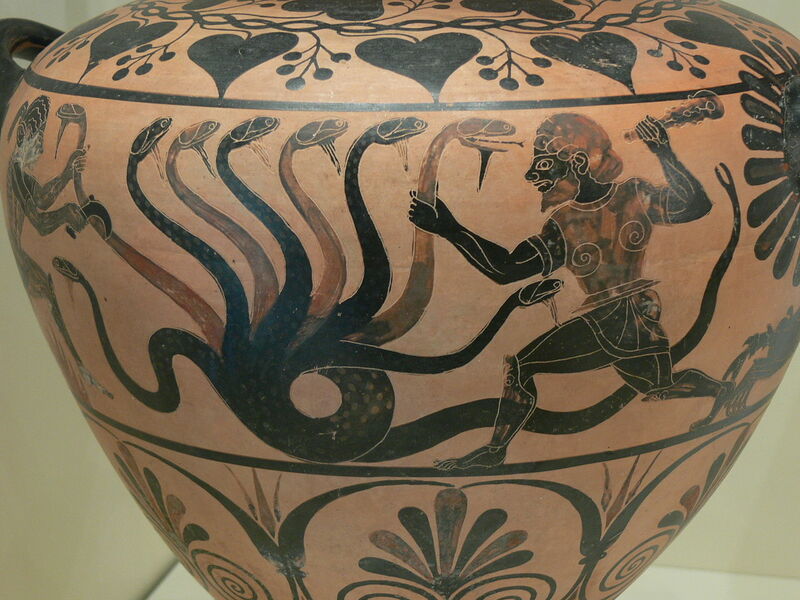 Heracles fighting the Hydra. Source: Wikipedia. Near the cave of the Anigrides Nymphs [the Nymphs of the Anigrus river], there is a source that makes the region downhill marshy and waterlogged. Most of its water flows into the Anigrus river, which is deep but slow and therefore forms stagnant pools. This boggy place emits an offensive smell over a distance of twenty stadia and makes the fish unfit to eat. 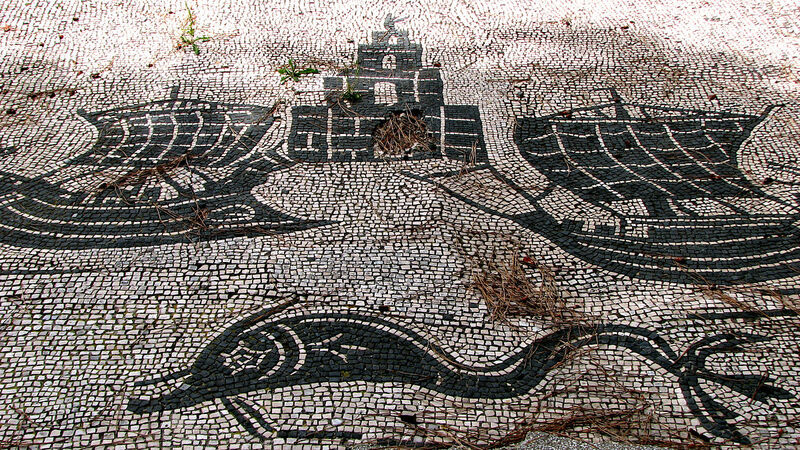 There are various stories about this: some say that some wounded Centaurs washed off the poison from the Hydra there [after the battle with Heracles]; others that Melampus used the waters of the Anigrus as means to purify the daughter of Proetus [these daughters had been stricken with madness]. The bathing water there cures white spots, lichen and other skin diseases. Strabo, Geography 8.3.19. If you wish to learn more about the industrial dispute from experts, I recommend the USSbriefs. This extraordinary month of strikes has come to an end. We had a great rally at Cardiff University today, with rousing speeches and rallying songs. Then many of us who are involved with the union retired to the pub. In British universities, strike songs tend to be pastiches of well-known pop songs. Super-talented colleagues treated us to new versions of, among others, Dolly Parton’s “Jolene”; Oasis’ “Wonderwall”; and The Red Hot Chili Peppers’ “Californication”. But best of all, was Steven Stanley’s original rap “Get your paws off our pensions” (which you can watch here). I am sure Britain must have a tradition of workers’ songs, but I do not know them, which is rather sad. For I do like good workers’, partisans’ and revolutionary songs (see also here). This I have learnt from my father. I remember watching Dr Zhivago with him, and he would put the sound to full when the Internationale came on. As a teenager, I expressed my complete embarrassment, but secretly found this quite cool. But there is no better workers’ song than the traditional Italian Bella Ciao, which is now best known in its anti-fascist version (see the Wikipedia page for the Italian text and English translation), but started its life as a song of the female rice-weeders in the Po valley, who were hoping for decent working conditions (see here for the Italian text). Where the original version stresses the hardship of toiling in the rice fields of the Po Valley, among the mosquitoes and other insects, the anti-fascist version paints nature in a rather more bucolic fashion. The partisan asks to be buried on the mountain under the shade of a beautiful flower, by which s/he will be remembered. 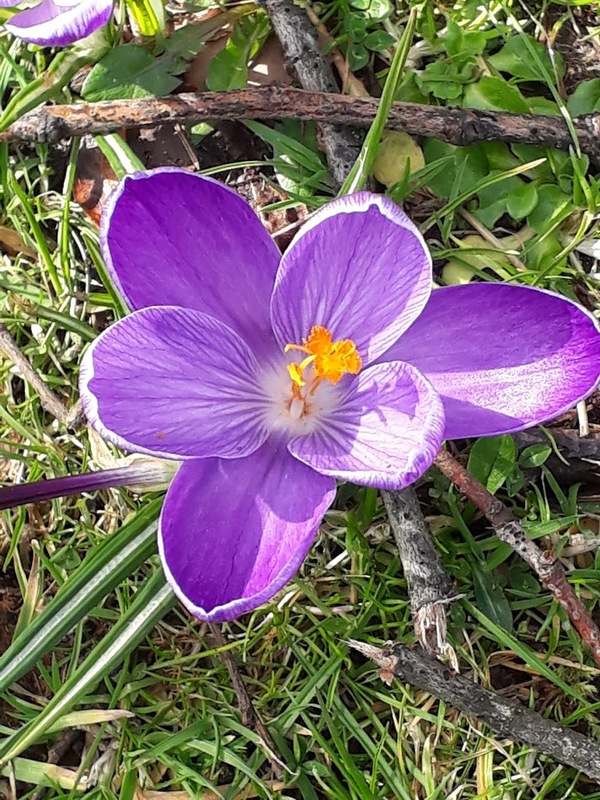 The purple season of flower-bearing spring smiles. And the blooming plants wave their new leaves. Laugh as the rose opens. And the goatherd delights in his white kids. Their sails swollen by the gentle breath of Zephyrus. people shout in honour of Dionysus, bearer of grapes. The fresh white beauty of their porous comb. The swan on the bank of the river, and the nightingale in the grove. How should a singer not sing beautifully in the spring? We are now nearing the end of our planned strikes. Tomorrow will be our last day. There will probably be further strikes in April, May or June if negotiations fail to bring resolution to this dispute, but we will return to work on Monday. To be honest, I worry about this return to work. Apart from my maternity leaves, this is the longest time I have been away from my desk since I finished my PhD in September 2005. For I have fully withheld my labour. I feel that if, as a lecturer in relatively secure employment, I disrupt students’ learning and delay administrative work, it is only fair that I should not seek to develop my own career by working on my research. I present my sincere apologies to colleagues in other countries to whom I owe pieces of work – I promise they will be ready very soon. That is not to say that striking was a break. This has not been restful at all. We have stood outside in all weather. We have spent hours on social media trying to rally people to our cause. We have attended teach-out events, open meetings and committees. In many ways, it feels as if we swapped one job for another one. We also allowed ourselves to dream about better universities. Universities that are not driven by metrics and audit exercises. Universities that are communities of scholars, of people passionate about education. So it is with some sadness that I will attend our last rally tomorrow, and with mixed feelings that I will return to work on Monday. I know that I am not alone in feeling this way, and perhaps we need some poetic encouragement. smiles, undisturbed by the chilly winds. and spread out the delicate folds of your ships’ wings. Go to trade, trusting in kind Priapus. Go trusting in the god of harbours. May we be of good courage! This post is dedicated to the memory of Piero Tassinari, my friend and colleague, who passed away on the fourth of October 2017. He loved poetry and sailing and considered education to be a public good. Here is an extract from a film he made with Italian reporter Paolo Rumiz. It is stunning. Strikes are unnerving and unsettling. It is perhaps for that very reason that they are also sites of great creativity. There is so much art in making placards, creating slogans, and writing strike songs. Our Cardiff rallies are becoming more entertaining and more cathartic by the day. Another positive aspect of the strikes is that we get to meet people we would not meet otherwise. While universities praise interdisciplinary research on paper, it is fair to say that they do relatively little to facilitate that interdisciplinarity. Most British universities have lost their senior common rooms; staff are too busy to take their lunch hours; budgets for seminar series are dwindling. And when people from various departments meet, it is usually for administrative reasons, not to engage in “blue sky thinking”. So, quite strangely, striking can allow us to grow our academic circles. If I were to use a botanical metaphor, I would say that strikes offer unexpected opportunities for cross-pollination of ideas. I touched upon the history of pollination yesterday, and I return to it today. 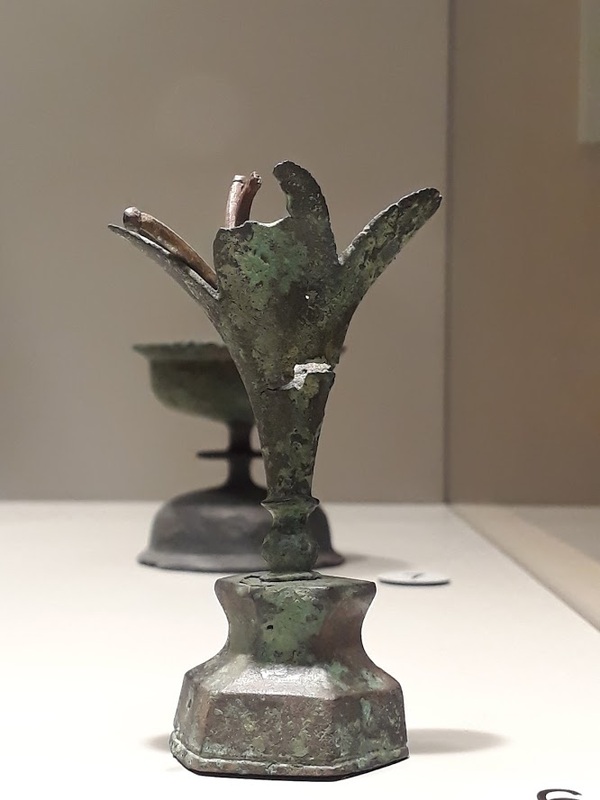 The Greeks and Roman described processes that we would call pollination processes (in particular in the case of the fructification of the date palm; see here), but they did not understand pollination: they did not understand the ways in which plants reproduce sexually. This is why they could come to the conclusion – rather absurd in our eyes – that bees could damage flowers. We find that conclusion in an oration attributed to Quintilian (first century CE), on which I have written a few years ago (see here): a poor man and a rich man are neighbours; the poor man has bees; the rich man has flowers; the rich man accuses the poor man’s bees of damaging his flowers; the rich man sprinkles his flowers with poison; the bees die; the rich man is accused of wrongdoing. Then follows the long defence of the poor man (Pseudo-Quintilian, Orations 13). Two goats he there struggled to maintain. “His flies constantly on our flowers feed. To exact a toll on our meadows? And to boast about his harvest! And I do not need to pay more dues. By Jove, such a headache! To that, what did the bee respond? They are the spoils of the hive or the wind. He even managed to sweeten their bile. The story is clearly inspired by pseudo-Quintilian’s oration, but with some twists. The poor man’s neighbour is not presented as particularly rich, but rather as a narrow-minded, avaricious bootlicker, who has no understanding of new advances in science: he does not know what pollen is. The story is also given a moral ending: when the winter sends diseases to Peter’s neighbours, it is his honey that heals them for free. There is a lesson here for modern universities! The last 24 hours have been filled with drama. At 8 pm yesterday, a tweet by the Financial Times pensions correspondent, Josephine Cumbo (who has been doing excellent work throughout this dispute), announced that an agreement had been reached between employers and our union. As the details of the “agreement” came in, most of us realised that it was entirely unacceptable: we were still being promised poverty in old age. Within 30 minutes, #NoCapitulation was trending on Twitter. By 10 pm, an open-letter asking to reject this deal had around 5000 signatures. We live in the digital age! This morning, union branches throughout the country met to vote on the “agreement”. At Cardiff, we had to assemble in a local park because the community hall that had been booked was too small to host everyone. After a great exercise in direct democracy, we voted to reject the agreement. Nationwide, one branch after the other did exactly the same – unanimously. We sent our negotiators back to the table. Groups of students in many universities occupied buildings. At Cardiff, a meeting at the Welsh Assembly had also been scheduled today. We travelled by buses to the Senedd and listened to speeches by several Assembly Members and trade unionists. I won’t lie. I’m exhausted. I want to go back to the class room. This afternoon, I felt like giving up this diary. I felt so depleted. However, the beautiful weather – and a nap – gave me a boost of energy; and here we are for my thoughts for the day. Colin the Caterpillar Cake. Photo by Ben Sutherland available on Wikimedia. In fact, the following thoughts have been with me since the beginning of the strikes. I have found myself thinking about butterflies a lot over the last month. You see, our local strike slogan is #HelloColin, after our Vice-Chancellor’s first name, Colin. 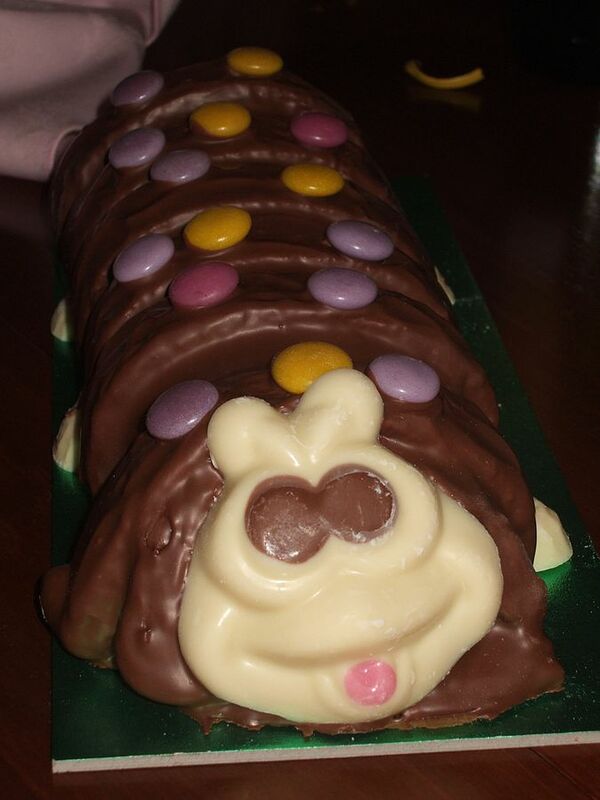 “Colin” is also the name of a Marks & Spencer’s caterpillar-shaped cake. (Wikipedia informs me that more than 7 millions Colin the caterpillars have been sold since it was introduced in 1990.) Picketers at Cardiff have of course exploited to the full, and in good humour, the association between our V-C and the caterpillar. So I’ve been racking my brains and tried to think about Greek and Latin botanical texts referring to pretty butterflies flying over beautiful flowers. I could not recall any, and a look at a few works on animals in the ancient world confirmed this. The Greeks and Romans wrote very little about adult butterflies. Instead, they concentrated on the – far more pesky, from a farmer’s point of view – larvae and pupae. 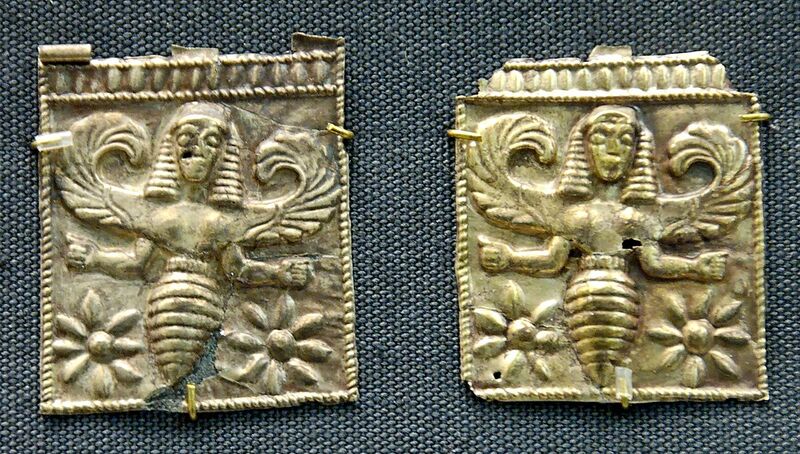 This is partly because the ancients had no understanding of the process of pollination (see here for more detail), and could not therefore appreciate the important role butterflies and other animals play in the propagation of plants. Change their form to become funeral butterflies. May my butterfly mind rest tonight! PS: some of you will have recognised the title of this blog as one line in Prince’s ‘When doves cry‘ – a beautiful piece of poetry. “Money doesn’t grow on trees”. In essence, that is what we are constantly being told in universities. If we, as staff, point out the discrepancy between that message and the fact that UK universities are engaged in huge building projects both on local campuses and abroad, we are told (again in essence) “university finances are very complex”. I am certainly no expert in matters of pensions. But I am an expert in the history of botany, and I can tell you that money trees do exist. 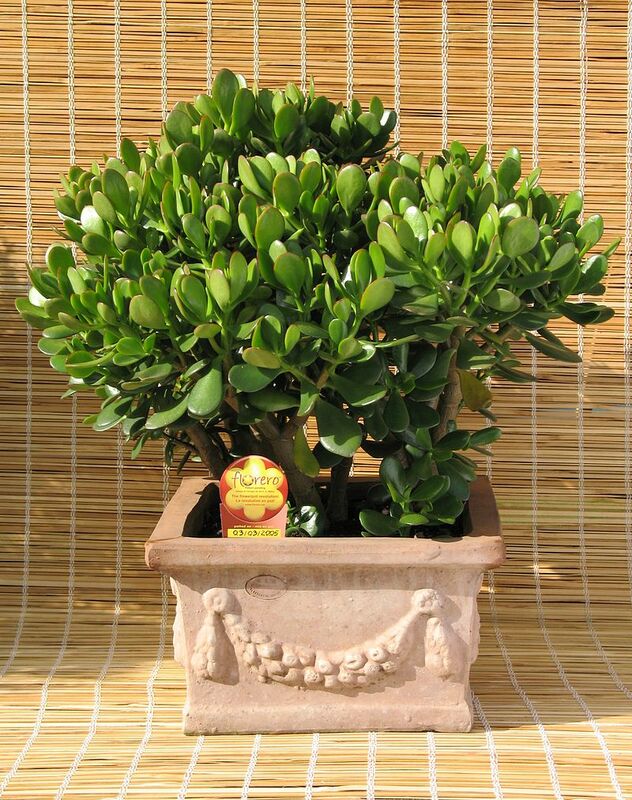 I am not referring here to the succulent plant commonly known as “money tree” (Crassula ovata (Miller) Druce), but rather to various folkloric trees that are made to bear money. As it happens, I came across one such tree – a wish tree – during a walk yesterday near Symonds Yat, a village straddling the river Wye. From the car park on the East side of the river, you access the river via a steep flight of steps. It is midway down (or up in our case, as we did a circular walk) that you can see a felled wish tree. This is a tree into whose bark coins were hammered. Hammering a coin is the equivalent of throwing a coin into a public fountain – it is supposed to bring good luck. I do not know whether this particular tree was first used for wishing purposes after it had been felled (there are also examples of wish stumps) or before, when it was still a living tree. If the latter, it is possible that the tree died of metal poisoning, which is rather sad but also very evocative: poisoning by money. The wish tree at Symonds Yat. Sorry for blurry pictures. It was pouring down with rain when I took the photo. 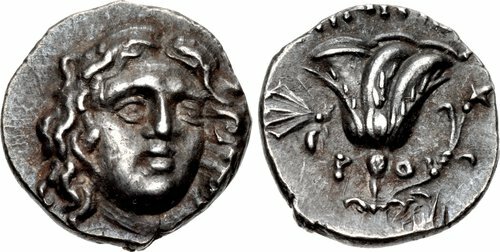 This happened with the wild olive in the market-place at Megara; there was an oracle that, if this were cut open, the city would be taken and plundered, which came to pass when Demetrius took it. For, when this tree was split open, there were found greaves and certain other things of Attic workmanship hanging there, the hole in the tree having been made at the place where the things were originally hung on it as offerings. Of this tree a small part still exists, and in many other places further instances have occurred (Theophrastus, Enquiry into Plants 5.2.4; translation Arthur Hort). Now that we have “established” that all sorts of things – including money – can grow on trees, can we please have our pensions back and return to work? Pretty please! After the great freeze (by British standards) of last week, the weather has turned very mild. There’s now a scent of spring in the air. On the one hand, this makes the act of picketing much more bearable; on the other, this has somehow dampened my resolve. There is something to be said for having to brave the elements: it distracts from the absurdity of the situation at hand. I have found myself overusing the word ‘absurd’ recently; still, it is the right one to describe much of what is going on. Thus, for instance, UUK (Universities UK, the body that represents our employers) announced on Monday afternoon that discussions with UCU (University and College Union) would be suspended until Wednesday afternoon, only to announce at around 8pm that same day on Twitter that it would meet with UCU ‘any time, any place’. I thought aliens had hacked the UUK Twitter account, but apparently not. Absurd, as I said. The tiled corridor in Cardiff’s Old Library. Source: Wikimedia. One has to try and keep sane in the face of absurdity. I do this by finding beauty wherever I can. So today, after my stint on the pickets, I went for a walk through Cardiff and I ended in one of the city’s ‘secret’ jewels: the tiled corridor in Cardiff’s Old Library. The building is no longer Cardiff’s main library, but hosts the tourist information centre and the lovely Cardiff Story museum. It is through the museum that you gain access to the tiled corridor (which is not always open unfortunately). The tiled corridor does exactly what it says on the tin: it is a beautiful display of late Victorian tiles. 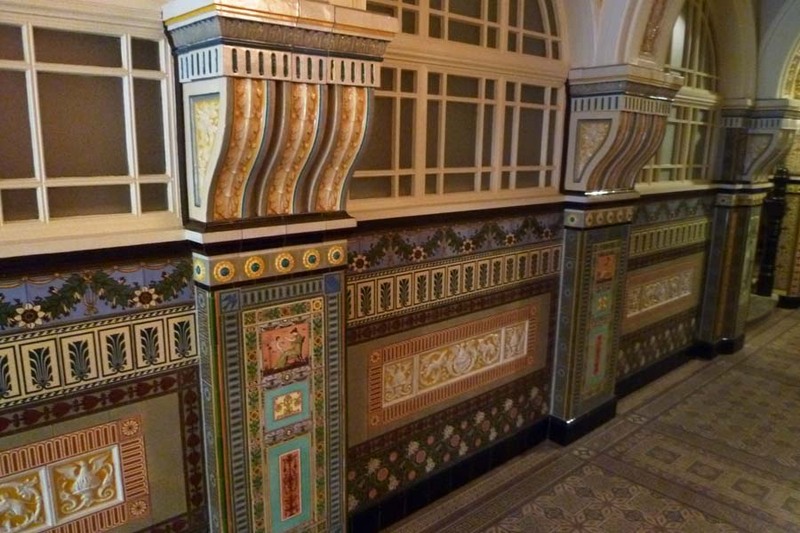 They were bought from Maw & Co, and the most striking tiles in the corridor were designed by Walter Crane. Crane (1845-1915) was a famous English member of the Arts & Crafts movement, who experienced with many different media. You will most probably be familiar with some of his work, even if you have never heard his name. 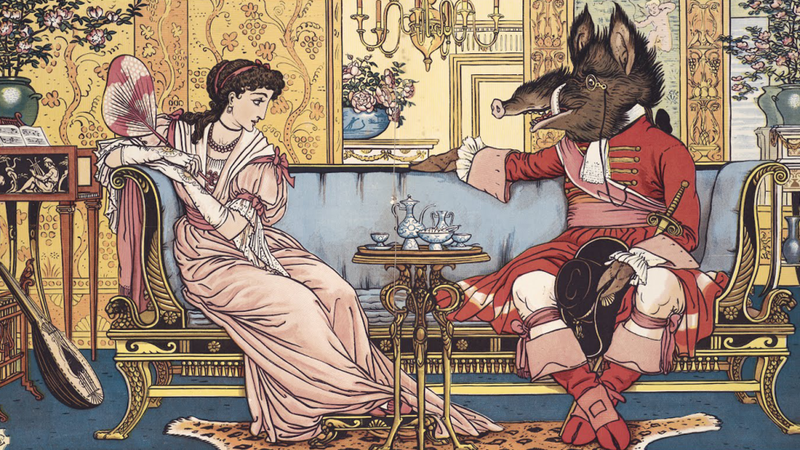 Walter Crane, Beauty and the Beast. Source: Wikimedia. Walter Crane, Ver. The Old Library, Cardiff. Walter Crane, Autumnus. The Old Library, Cardiff. I spent ten minutes at least in the tile corridor entirely on my own. This peace was most welcome after the hubbub of pickets and rallies. I came out stronger in my resolve to strike for decent working conditions. I highly recommend a visit to the Old Library!